Hi my name is Homa. I'm a lawyer turned stay at home Mom and I blog over at Oh my Deehness. We were vegetarians (my husband and I) and were raising our children the same but ended up going vegan when my daughter's egg and milk allergies became apparent. She is also allergic to soy, wheat, corn, oats, grapes, peanuts, tree nuts, sesame, and a few other foods. My son seems to have a few allergies of his own as well. They are 1 (my son) and almost 3 (my daughter). We live in Las Vegas and I blog about "safe" recipes and some of our adventures. My blog name comes from the way my daughter would say "Oh My Goodness" - it was just too cute not to make sure I wrote it down somewhere. 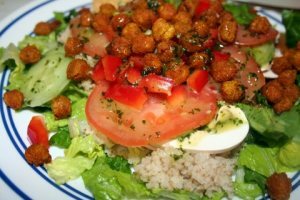 The recipe I am guest posting is Salad with Cilantro Lime Dressing, Brown Rice Couscous, and Roasted Curry Chickpeas. The cilantro lime dressing recipe, and the roasted curry chickpeas recipe can be found via the links. 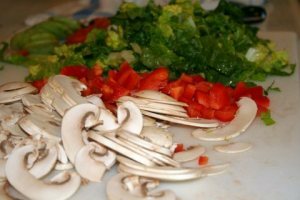 My husband expertly chopped the mushrooms as above. I still have a lot to learn about using a knife properly but mushrooms taste better when he chops them so thinly. Here’s where it all comes together! Maybe it is silly to have a recipe for a salad as I suppose this is more like a “meal idea” but at any rate, here goes nothing. . .
To make the quinoa, you just need to use 2 cups of liquid to every 1 cup of quinoa. Rinse the quinoa, add it to the liquid in the pot and heat until boiling. Reduce heat to low, cover and set your timer for 15 minutes or until the liquid is absorbed. Fluff with a fork before serving. We usually eat this salad with quinoa but for the pictures we used brown rice couscous by Lundberg because we’d had quinoa tabbouleh the day before. My husband likes this with red quinoa over the regular sort and I do enjoy it that way but most people say there’s not a difference between regular and red quinoa. Make a base of lettuce, add your grain of choice, top with veggies, then salt to taste, add roasted chickpeas, and finally drizzle with dressing. Hope you like my recipe. Come and visit me over at Oh my Deehness for more veggie meal ideas.